Please sign the guestbook or leave a message on the forum ! Latest Information and website info. This site is an attempt to log all the stages of my project to build a personal submersible with the intent of recording my progress, keeping me motivated and maybe helping any other people contemplating a similar project. Please read the DISCLAIMER page first. Please see the LOG section for details of the current build status. 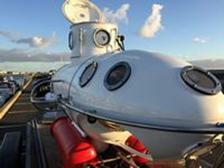 The design is based on the proven K-350 submersible designed by the late George Kittredge. Many of these subs have been built over the years, particularly in the United States. Almost all information related to this and other psubs is available at the very good web home of personal submarines, www.psubs.org and I will try not to duplicate information already available there. I am producing a list of all suppliers and contacts that I am using, plus detailed log of all build techniques used. Log of Building the Submersible. I have removed a lot of the pointless stuff from the website and added the “Operations” section and also the “Modifications” section. Its done. Completed the sub 28\7\2013. Polishing out a Scratch on a Viewport.